Glenn's Gourmet Goodies produces some of the most unique and versatile sauces that I've had the fortune of using. 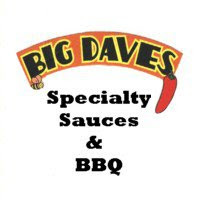 Each sauce, from White BBQ to Wasabi, starts with a soybean oil and vinegar base. It's like mayo without the egg. Glenn then cleverly expounds on these mild base ingredients with bold flavors like Chipotle and Wasabi. None of the sauces, however, is more bold than GGG's Road Kill E-Lick-Sir. Road Kill E-Lick-Sir is packaged in half liter (16.9 oz.) plastic bottles. Like GGG's Chipotle sauce, Road Kill is orange with coarse flakes of black pepper. Additional, more finely ground, spices can also be found in the sauce if you look closely. It's on the thicker side and pours slow, but steady. Road Kill's aroma is strong and distinct. I would compare it to a Thousand Island or French salad dressing with a TON of added pepper spice. One whiff told me that Road Kill E-Lick-Sir was not a mild sauce. I found the flavor to be very similar to GGG's Chipotle sauce. It may have the spice level kicked up a notch or two, but both sauce definitely share many ingredients. The sauce starts out smooth and finishes with a sharp, back of the throat burn. Like all of Glenn's Gourmet Goodies' sauces, Road Kill is incredibly versatile. I used the sauce to finish grilled chicken breasts. It gave an otherwise boring piece of meat phenomenal flavor. The spice mellows just a touch when the sauce is heated, but there was still enough punch to make sweat beads form on my forehead. Road Kill also works great as a dip for chicken fingers or anything else that comes out of the deep fryer. Perhaps my favorite use for Road Kill is as a mayo substitute for sandwiches and salads. Burgers and fish sandwiches can be taken to a whole new level with this sauce. It can also spruce up standard cole slaw, potato salad, or chicken salad. Just replace a portion (tailor it to your heat preference) of the mayo in the recipe with Road Kill. This is the third sauce that I've reviewed from Glenn's Gourmet Goodies. Each has been as tasty as it is unique. I can't say enough good things about Glenn's sauces. 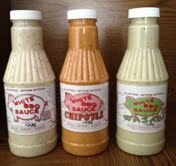 Very few companies produce white sauces and even fewer produce sauces with the same level of care and creativity. 0 Response to "GGG Foods' Road Kill E-Lick-Sir"